Tuesday seems to be the adventure day for July. Last week we ventured across Veteran’s Bridge (Route 128) and drove through Cadogan, Freeport, and Sarver. While we were out one evening last week, someone said that the boat launch area in Rosston was a nice place to go. 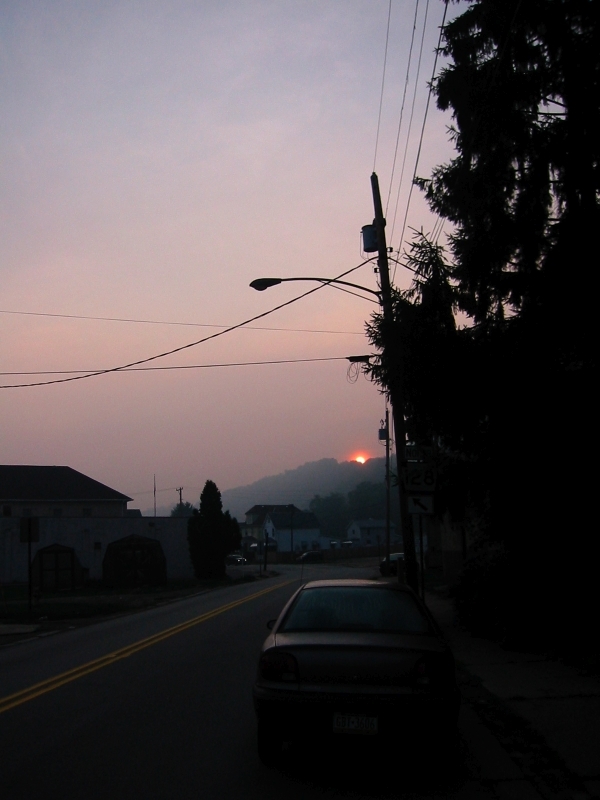 This morning it was 65°F, well in Bode’s comfort range, so instead of going up the street, we went into the car just as the sun cleared the hill. Ross Avenue starts with a left turn, toward the south, off Route 128 just before the Veteran’s Bridge. I could see the Armstrong Trail on the left until it appeared to merge with the road. We turned right at the Rosston Center signpost and parked by the boat launch area. 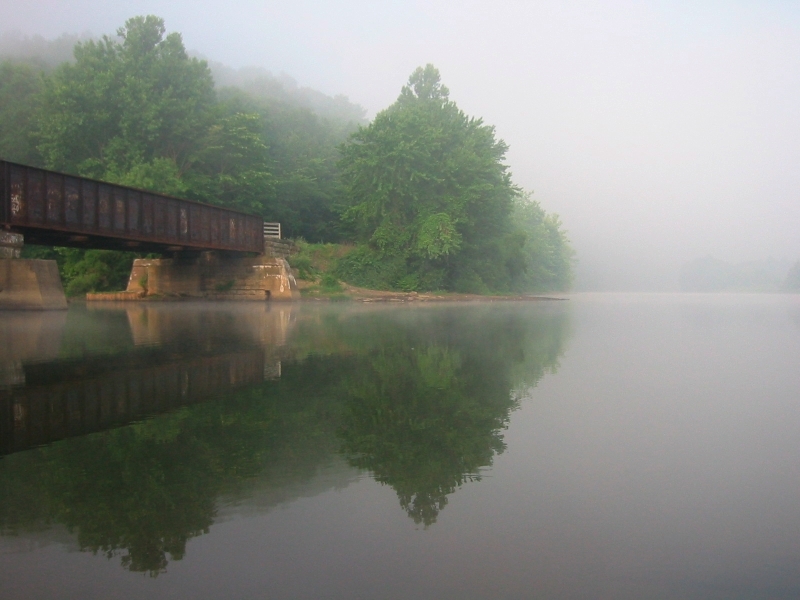 An old railroad bridge that had been converted for pedestrians crossed Crooked Creek. The mist was denser here than in town. 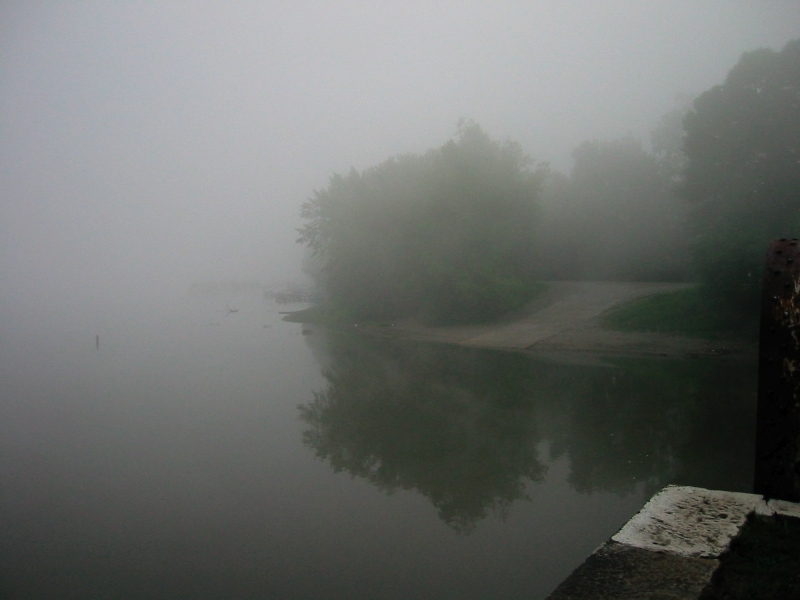 We passed one bike rider on the path, which went along the old railroad siding on the bank with the shore of a long island visible now and again through the mist. 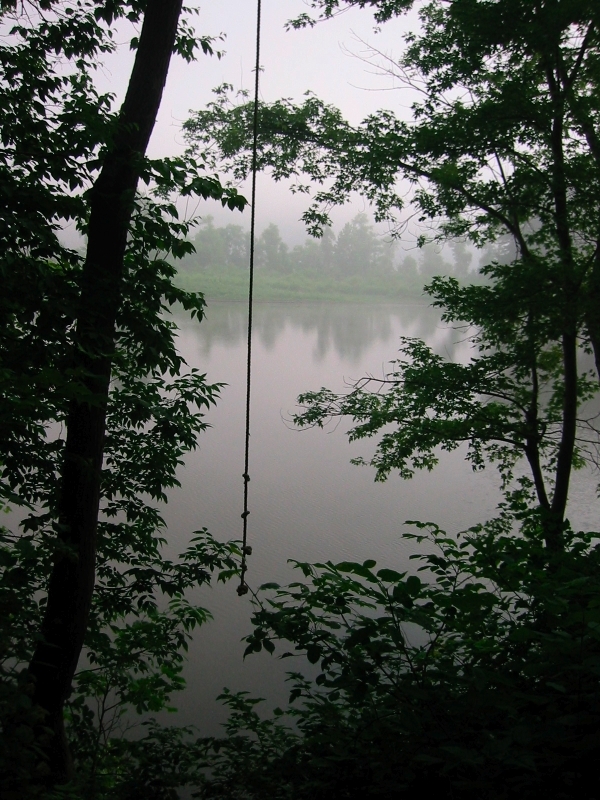 At one place, someone had hung a rope from a tree, looked like a fun place to swing into the river. There was a thicket of mountain laurel or rhododendron by the rocks at one place and wild roses several places, the still air was full of the scent of flowers. At one point we could hear geese. Bode walked very well, only pulled on the leash a couple times to investigate interesting scents. At one place it looked like deer had bedded down in the undergrowth between the trail and the water. With the path being level and Bode cooperating (when he pulls at the lead, my knees get sore) we were able to follow the path some distance, but didn’t pass the end of the island. When we came to a place where a spider had built a web that crossed the path, decided to not disturb it and turned back. The sun was starting to burn through the mist when we got back to the boat launch area. I took Bode down the concrete ramp to see how he would react to water. 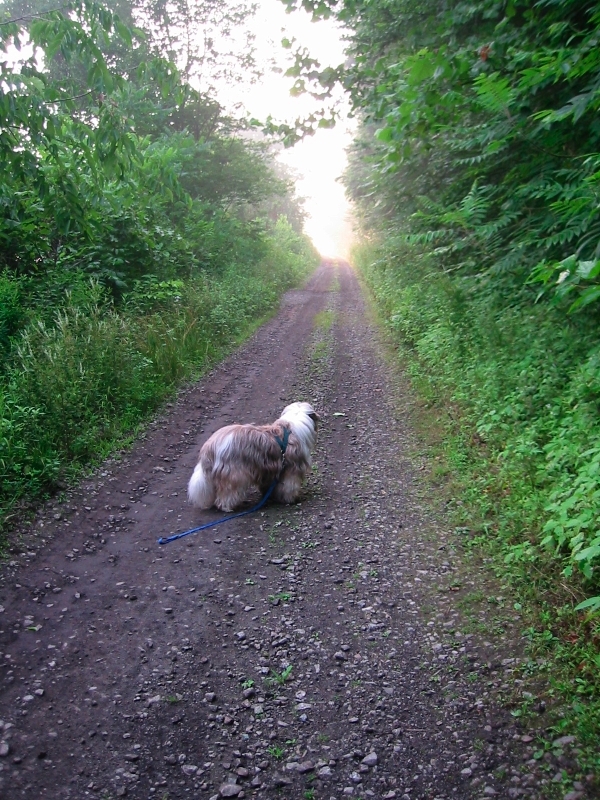 He sniffed it and turned back. I had to lead him into the water to rinse his feet. I sat on the ramp for a while and watched fish jump. The water was as warm as bath water, which explains the mist in the mornings. The air is a lot colder than the water. It would have been enjoyable to stay there for hours, but since neither of us had breakfast, we went back to the car and turned to the right at the signpost. I assumed the road would eventually join Route 66, which proved to be true. When we got home, I put some water on to boil for tea, and got a slice of bacon from the freezer and chopped up some of the new red potatoes from our visit to the Franklin Village farmer’s market on Saturday. When the bacon was done, I put in the potatoes, then added an egg when the potatoes were well browned for a hearty one pan breakfast. Bode is already napping and I think I should do the same while it is still cool. This entry was posted in Cooking, General, Photos. Bookmark the permalink.